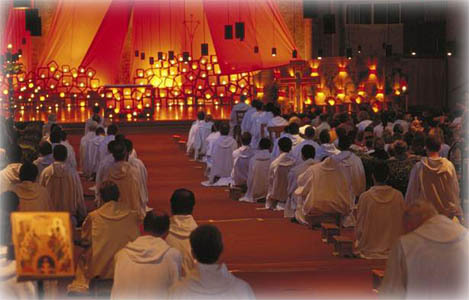 A number of Carmelite individuals and communities worship in the style known as "Taizé Prayer". With its simple blend of beautiful chant, Scripture reading and silence, Taizé Prayer is very much in keeping with the Carmelite emphasis on the value of stillness and pondering God's Word. Since Taizé Prayer brings together Christians of different traditions it also helps Carmelites live out the Order's commitment to ecumenism. This prayer format was developed at the ecumenical Taizé Community in a French village of that name. This monastic community was founded in 1940 by Brother Roger Schutz, and quickly developed as a centre of reconciliation between people of different nations and different Christian denominations. The community of about 100 brothers has a strong commitment to justice and peace, nourished by prayer and meditation. The Taizé community at prayer. Taizé Prayer is regularly practiced once a month at the Carmelite friaries in York and Faversham. Taizé Prayer in the chapel of the Carmelite friars in York. Taizé Prayer in the Carmelite-served parish in Faversham.